Buck Anderson’s life seems to be changing completely. His best friend, David, has moved away; his anxious parents are hounding him more than ever; he has reluctantly agreed to fill in for his uncle and do odd jobs for a grumpy old veteran in town; and his twin sister has a new boyfriend and is never around anymore. To top it all off, Buck is bullied by a group of boys at school—mainly because he stutters. There is one thing that frees Buck from his worries. It is the heart-pounding exhilaration he feels when exploring underground caves in and around his hometown. He used to go caving with David, but he's determined to continue on his own now. He doesn’t know that more changes are headed his way—changes that just might make him rethink his view of the world and his place in it. Buck is looking at difficult summer at his rural home near the Blue Ridge Mountains. His best friend has moved away, he's being teased by boys in his class who mock his stutter, and he has to do a lot of work in the family garden and also for a man his uncle has been helping. All Buck wants to do is to investigate the caves near his home, but his parents won't let him go without someone else. Luckily, working for Jacob Wall has its advantages; Wall once worked with veterans who had speech issues, and is willing to help Buck for free. In the meantime, Buck also helps his grandfather investigate plywood thefts at the family lumberyard with the help of his older brother and uncle. 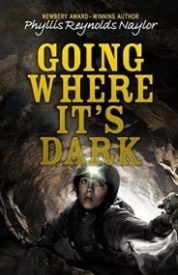 When the boys from his class who have been making fun of him drop Buck down a pit quite some way from his home, he knows he can use his spelunking skills to get home, but the adventure is more harrowing than he expected it to be. Going Where It's Dark has a great sense of place, as well as a number of well-developed characters. Buck's family is very supportive, even though his parents are struggling with work issues, and it's nice to see the inclusion of his truck driving uncle who is around from time to time, as well as his twin sister, who has secrets of her own. The two biggest issues in the book are Buck's speech problems, and his interest in caving. Both are treated with care, and the research and background knowledge Naylor has of both of these is evident. I just wish that the excitement of the caving adventure had come much earlier in the book. Some tighter editing would have made this a stronger story; there are a lot of things going on in the book that are less than interesting. The plywood stealing could have been cut out, and while the boys ridiculing Buck for his stutter were necessary to get him into the cave, it's hard to believe that this sort of behavior would have been tolerated by any adult in the picture. Buck's mother taking him to the faith healer also could have been cut. Naylor is such a good author that it seems rude to criticize her work. This was a good book that could have been even better.